From the most simple data project to complex menu driven applications, this will become your program doing what you want. Access is a powerful, flexible, data management platform that can be tailored to your needs, and we can design the tables, queries, reports and forms to your specifications. Stop using Excel sheets for data ! Rather, you can have data entry forms that make sense to your staff. You can easily query this data and you can print reports that impress your clients or help your people work. More, we can embed business logic or math behind the forms - Access then is the tool we use to make a whole program to your design. We are experts in all aspects of Access; table design, application programming, database repair, user training, data conversion, moving a system from one machine or network to another, scaling up to MySQL or SQL Server, and moving your data onto the web. We have supported and enhanced applications written by others, and are pleased to step in to advance older or troubled projects. Access is the ideal tool, combining a rich graphical front end with a powerful programming language. From the smallest table and report designs to the most complex front end Access / backend SQL Server application, we can solve your problems. The Hammel New York warehouse needed a custom inventory system...with bar coding and web integration. It would need to be fast, with custom reports; and it would need to push it's data up onto the web so that salesmen and the front office could see what was on hand. To do this we read the data files and programmatically create an HTML web page with the data embedded. Using the Microsoft schedule program we FTP the new web page to a secure password protected web site. All of this was done by us in Access. Here is a screen shot of some of the major menu pages and the order entry system and the inventory page. Long Island Builders Institute needed a database system to track 600 members; not a great matter, you say ? But these builders had scores of meetings, (and members who wished to be informed when and where they were, and the main office wanted records ) and contributed to various funds, and printed various books of members and their services , and wished to share some of this data on the web ... All of this was done by us in Access. What started out as a simple table grew over 4 years into scores of tables and perhaps 100 reports and queries. Here's a screen shot of a typical Access report from this project, along with a list box giving a choice for the town to draw the data from. Splash Designs of Manhattan represents designers and sends out artist's prints to clothing manufactures, and needs to track which artist produced them, where they were shipped and when they should be returned. This subsystem integrates with a 6000 record database of clients and contacts, along with a proprietary calendar/appointment system. Running on an 11 station LAN, Splash now runs it's business on our software. Here's a screen shot of the main data management page. Debticated Consumer Services has thousands of clients, all making payments to get out of debt ... we designed and wrote a system for tracking these clients, their payments, and the support staff servicing them. We then wrote a system for calculating payments. This system drew from a table of thousands of creditors , each with it's own payment rates and discounts. 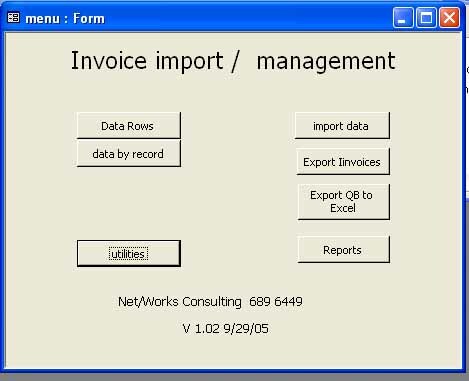 Done in Access, this calculator is used by 5 to 10 staff on a network simultaneously, demonstrating the power of MS Access . The system saved tens of thousands of dollars in clerical error, and has greatly enhanced staff productivity . Here's a screen shot of the payment calculation page. Note that we have here a mixture of data and behind the scenes math. The user chooses a creditor, and then enters the amount; the program (driven by our coded instructions) then makes calculations and summations. Nothing very complex here ( though very effective for the client); we could have just as easily done far more complex calculations of a financial, statistical or scientific nature. Cablevision Corporation needed to allow it’s business units to modify employee data prior to uploading all staff into an EIPP (electronic invoice processing) system. We took data stored in Oracle, brought it into Access, and designed a front end for easy changes to four associated tables. Our system allowed the creation and tracking of chains of responsibility and invoice routing through the company. Some units preferred modifying data in Excel, and we downloaded data into sheets and wrote code to validate data as it was brought back into Access. A screen shot of the main form doesn’t do justice to the complexity of the project and back end code. ADM (Archer Daniels Midland Company) buys and sells commodities and has a subsidiary dedicated to such trading on Wall Street. Billing was still being done in Excel spreadsheets, involving much manual formatting of the invoices. We designed and wrote an invoicing program. 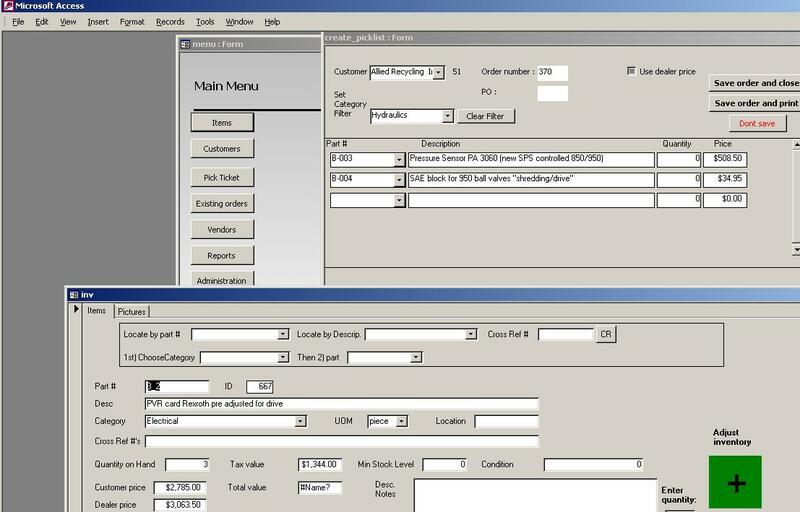 Using business rules (proprietary; but we can show you a screen shot with our test data) embedded in the software much higher efficiencies were reached. These are a just a few out of the hundreds of applications we have written, many not in Access but in one of the many other database environments out there. When to go beyond Access ? Call or email for a free quote. How can we help organize your business better ?